A picture of Gurmehar Kaur, daughter of a soldier who was killed in 1999, went viral. 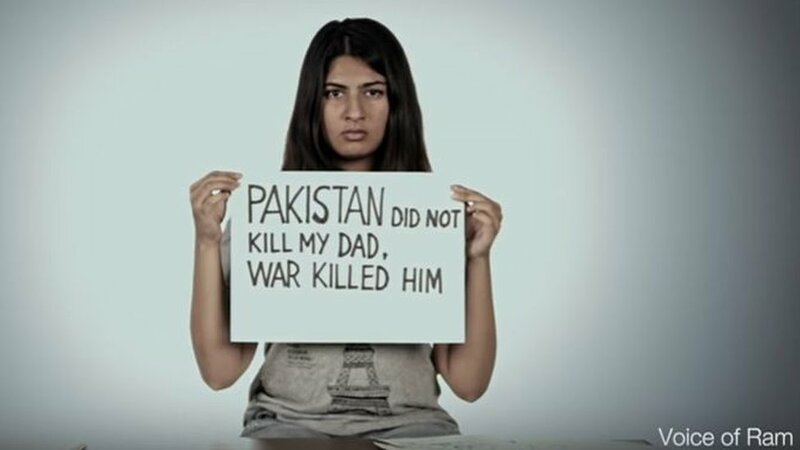 In the picture she was holding a card and the message, “Pakistan Did Not kill my father. War killed him,” was written on it. Majority on the social media saw it as a pro-Pakistani stand. A Nationalist and Martyr’s son Manish Sharma posted a controversial reply to Gurmehar Kaur on his Facebook wall. Here is Manish Sharma’s post, shared on his Facebook wall. You have became a household name is last couple of days, all credit goes to your Viral Video and couple of interviews where you were advocating for freedom of speech and also mentioned that “Pak Didnt kill your Dad, It was WAR which killed him”. I usually stay away from such public display of emotions,but this time I feel it is going too far….don’t know if you are doing it intentionally or unintentionally but your acts are hurting the sentiments of the Defence Families. Let me start with my introduction here…I am working as an IT Professional in an MNC. My Father was an Indian Army Officer….who sacrificed his life during Operation Rakshak in Sri Nagar…while fighting with Terrorists…I really dont know if I should blame War,Pakistan,Politician or what not…..because of them my Father was fighting right there….in an alien land…where locals say “India Go Back”. My Father sacrificed his life for them, for us, for our Nation. So now it seems we are at the similar Moral Highground…you are a Daughter of a Martyr, so am I a Son of a Martyr. Now let’s move further…step by step. You said that Pakistan didnt kill your Father, it was the War which killed your Father. My simple question to you? With whom your Father was fighting? Was it his personal War or were we fighting against a Nation? Was it your Father’s choice to fight that War, or was it forced on him,on our Nation? Obviously it was Pakistan and it’s acts which atually forced your Father and many such Army Officers to serve in Kashmir in so much hostilities and ultimately sacrifice their lives. It may seem logical to you to blame War for your Father’s death…but guess what….there were multiple reasons for his death. 2) Lack of Political will of Indian Political Leadership. 3) Back to back Blunders by our Leadership. and last but not the least….it was your Father’s passion and his commitment towards his duty which lead to his death….yeah it was. Your Father was very young when he lost his life…you were only 2 years old…… It was his sheer passion towards our Nation..our Flag and Ijjat of their Regiment which gave him courage to commit this supreme sacrifice. Do you know your Father laid his life for the Land of Kashmir…..the same land for which these JNU Jhola Chhaps asking for Freedom. both our Fathers fought and lost their lives. and guess what? You being an informed citizen….still advocating for those eunuchs….those people who try to use People like you as their Pawns….to run their endless propaganda. my simple question to you…what is this Freedom of Expression for you? Does that mean you can raise slogans to break India apart? Does that Freedom of Expression gives you the right to offend the People….like your and my Father…and millions like them who are guarding our Borders day and Night? Miss Kaur…this is not Freedom of Expression…..If your Father was alive today…he would have taught you better. My humble request to you….please learn something from your Father….Learn at least respecting your Nation…because NATION always comes FIRST. Hope I was able to make my points clear.